Adult party that's clean fun for all! AN ADULT PARTY WITH SNAKEBUSTERS IS THE BEST ADULT PARTY! For your adult party, snuggle up with a python, curl up and bond with a crocodile, get up close and personal with the world's most spectacular and "dangerous" reptiles..., have a wild action packed adult party! What makes a snakebusters adult party better than any other advertised "reptile parties"? Our reptile party has the most "hands on"
We are the most fun adults party with reptiles! 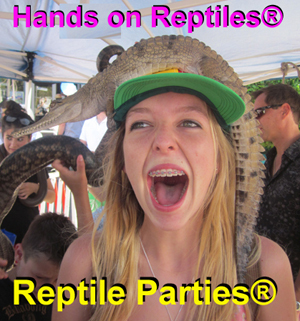 or, (see the link for all shows and parties), but the main thing that people notice is that our reptiles parties are "full-on - hands-on" as in usually everyone holds pretty much everything - AND - without waiting. Lots more critters at a time at our adult reptile party and your staff or guests can hang onto their reptiles rather than handing them on, because we bring enough for everyone to hold at the same time! No other adult party with reptiles comes close! Deadly snakes that don't bite (another Snakebusters exclusive), harmless snakes, monster pythons, lizards, crocodiles, tortoises, frogs, a gift that isn't junk, etc ... we bring the lot to our adult party in the ultimate team bonding event! Snakebusters are perfect for 21st's, 40th's, 50th's, corporate team building entertainment, VIP guests, international VIP's, meet and greets, trade promotions and more! Our fun is good, clean and educational, so you are less likely to offend any guests! Pricing is usually from $300 per adult party (Melbourne metro, 2011). Snakebusters are alone in Melbourne in not quoting surcharges for Crocodiles, no more dollars to bring the deadly snakes (which we alone can bring), not quoting extra for people or guests above some miniscule number (no limit on guests at our totally wild party!) and free invitations (see links here). It's best to phone us (day or evenings are OK), rather than send e-mail. We don't get all e-mails sent and don't necessarily respond to them straight away. More importantly, as Melbourne, Australia's most sought after adult reptile party and wildlife demonstrators, we're always heavily booked, so it's best to book Snakebusters before sending out your party invitations and the like. (or questions worth asking if shopping around for reptile parties or "hands on" reptile display in Melbourne). Return to the Snakebusters main website entry for corporate incursions, corporate promotions, trade expos, incursions, education, snake shows, film, TV, etc. Adult parties Melbourne, Victoria, good clean fun, adult reptile party in Melbourne, adult crocodile parties Melbourne Victoria, adult snake parties Melbourne, Victoria, Australia, adult parties in Melbourne, Snakebusters are Australia's most wanted adult reptile party, snake and reptile shows for adults birthday parties with reptiles, with most hands on, most audience interaction, best for incursions and with the best reptiles displayed in an adult reptiles party. 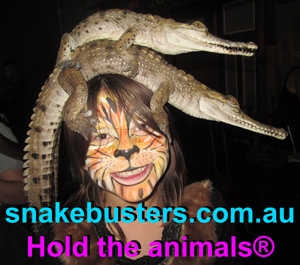 © 2015, Snakebusters, as seen on TV specialize in adult parties in Melbourne, adult reptile party entertainment events, adult entertainment with reptiles, including crocodiles, snakes, lizards, frogs, turtles, including snake handling and crocodile handling, throughout Melbourne, Victoria and Australia. Copyright. All rights are reserved. adults parties Melbourne, adult parties Melbourne Victoria, adult party activities Melbourne, Victoria, adult reptile party in Melbourne, adult party.